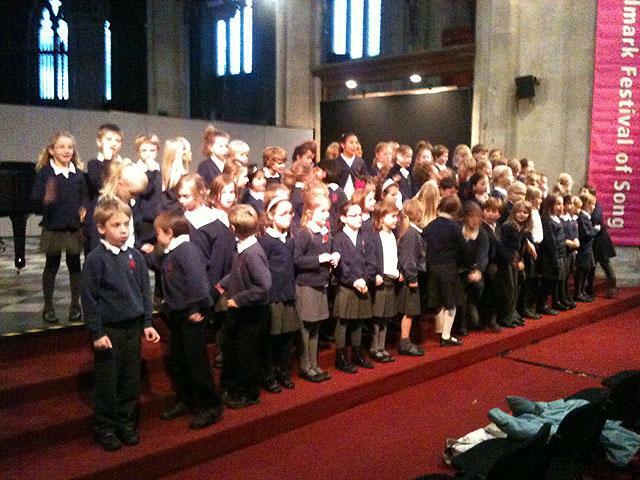 On Wednesday 7th November Year 3 and Year 4 went to the Landmark Centre. We walked from Collis to the church when we got there we got into our starting positions and we had a little practice to warm up our mouths. When we had finished our practice the other schools started coming in. The other schools were called Sacred Heart and Hampton Hill Junior. Then they had their practice. Once they were done the parents and children took their seats. Collis were up first to sing, we sang two Halloween songs and a little calm song. Then it was Sacred Heart’s turn, they sang a few little songs. Then finally it was Hampton Hill Juniors turn and they sang 3 songs. After that we all sang a song together, it was called ‘Mango Walk’. Then we got the most tremendous clap from everybody! Finally we all had to go home. On fantastic Wednesday 7th November we set off to the Landmark arts centre. When we got there we took off our coats and had a practice of all the songs. We sang three songs. One of them was called Rollerghoster. We all loved it.